Former Vice President Joe Biden said at an event in Michigan on Tuesday that age was a "totally legitimate" issue to raise for presidential candidates. Biden, who will turn 78 shortly after Election Day in 2020, has said he will decide if he will pursue the Democratic nomination by January. He would be by far the oldest elected president ever if he won. "I think age is a totally legitimate thing to raise," Biden said during a question-and-answer session, according to CNN. "I think it's totally appropriate for people to look at me and say if I were to run for office again, ‘Well God darn you're old.' Well chronologically I am old." 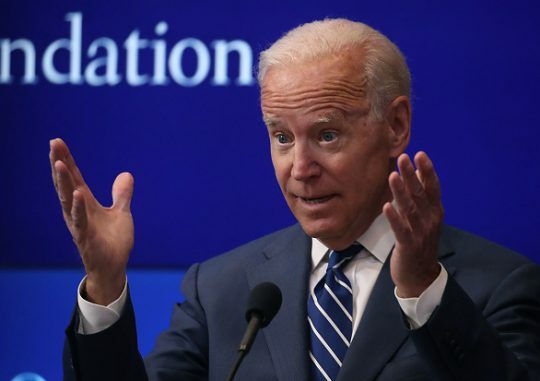 President Donald Trump said in July that Biden would be his "dream" opponent, pointing at his previous failed bids to win the Democratic nomination. Biden most recently ran in 2008 and dropped out early in the process, before Barack Obama eventually tapped him as his running mate. "I dream about Biden. That's a dream," Trump said. "Look, Joe Biden ran three times; he never got more than 1 percent, and President Obama took him out of the garbage heap and everybody was shocked that he did." Trump was the oldest elected president in U.S. history when he won in 2016 at the age of 70. Were Biden to run, he would join what looks to be a crowded field of contenders eager for a shot at Trump. He led a large group of potential candidates in a recent CNN poll, with 33 percent of Democrats supporting him. The next-closest candidate was Sen. Bernie Sanders (I., Vt.) with 13 percent. Other prominent Democrats mulling a run include Sen. Elizabeth Warren (D., Mass. ), Sen. Cory Booker (D., N.J.), Sen. Kamala Harris (D., Calif.), Sen. Kirsten Gillibrand (D., N.Y.), former Massachusetts Gov. Deval Patrick (D.), former Attorney General Eric Holder, former Obama administration official Julián Castro, Los Angeles Mayor Eric Garcetti, and attorney Michael Avenatti.